From letters and documents to books, clothes and gifts, you can ship anything and everything with our range of envelopes and mailing bags. They’re designed to protect your products in transit, so whatever your business sends, make sure it arrives in perfect condition with Rajapack. As well as business envelopes, Rajapack offers a range of cardboard, padded and bubble envelopes. to give you extra protection against knocks and bumps. 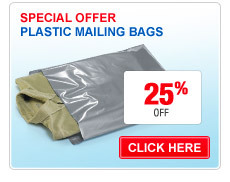 Alternatively, you could opt for polythene mailers and plastic mailing bags – they’re tear-proof and water resistant, giving you protection against the elements. Remember, Rajapack has experts on-hand to help you find the right packaging solutions for your business.